Being adopted by a forever family is the beginning of a wonderful journey for a cat like Andre, one that sometimes begins under the bathroom sink. Andre (formerly known as Simon) was fostered by Friends of Noah volunteer Kathy Strommen, and he was eventually adopted by a very loving (and patient) family. Below his new parents, Emily and Brian, archive Andre’s journey from cowering under the vanity to…well, pretty much doing whatever he pleases. At first, he was nervous and hid under the vanity in the master bathroom. He actually dusted under there for us, which was very considerate. Then after about 24 hours, he became curious and came out to check us out. 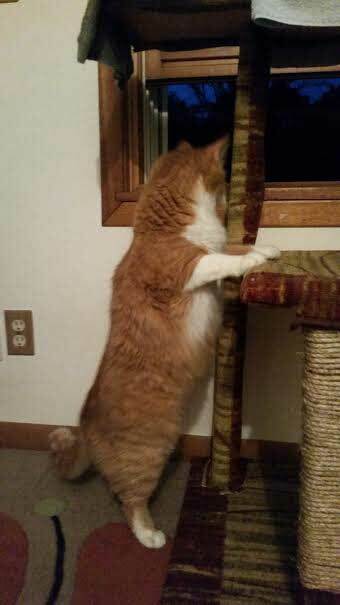 Here he is investigating his cat tree. This is the photo that inspired his name.